This is another dish that is elegant enough to serve guests, yet is easy and quick enough for a weeknight meal. 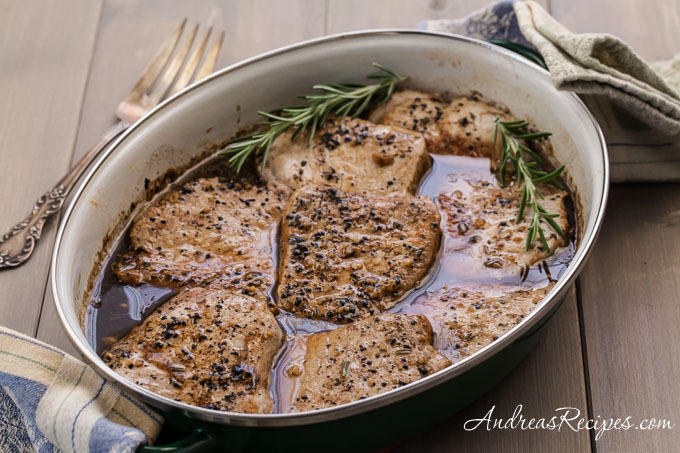 The glaze adds some incredible flavor with the balsamic vinegar, honey, and rosemary. Use slightly less honey with an older, sweeter balsamic vinegar, and slightly more with a younger balsamic vinegar. If you really like the glaze, make some extra so that you can spoon it over Garlic Mashed Potatoes. You can buy a whole loin and slice it into 1-inch medallions, which I do and then freeze the extras, or you can purchase just four pork medallions or smaller pork chops for a small dinner. I say that this one counts as a kid pleaser because my toddler kept asking for more during Sunday dinner! GLAZE: In the small bowl, stir together the garlic, rosemary, balsamic vinegar, honey, olive oil, mustard, salt, and pepper. PORK: Cover the bottom of a medium skillet with a light film of canola oil and heat over medium-high heat until hot. Add the pork slices in a single layer, season with salt and pepper, and sear for 1 minute. Turn and sear for 1 more minute, until lightly browned. Transfer the slices in a single layer to the shallow baking dish. Roast for 8 to 10 minutes. Remove from the oven and keep warm, loosely covered until ready to serve. Spoon the balsamic-honey glaze over the medallions to serve and add more freshly ground black pepper to taste.